Palace of Horticulture, Panama-Pacific International Exhibition, San Francisco, California, 1915, an autochrome by an unknown photographer, via George Eastman Museum Commons on flickr. The Exhibition was open from February to December 1915 and celebrated the completion of the Panama Canal in 1914. It also showcased the city’s recovery from the devastating 1906 earthquake. Its palaces and halls were built on a 635-acre site along the city’s northern shore, between the Presidio and Fort Mason. 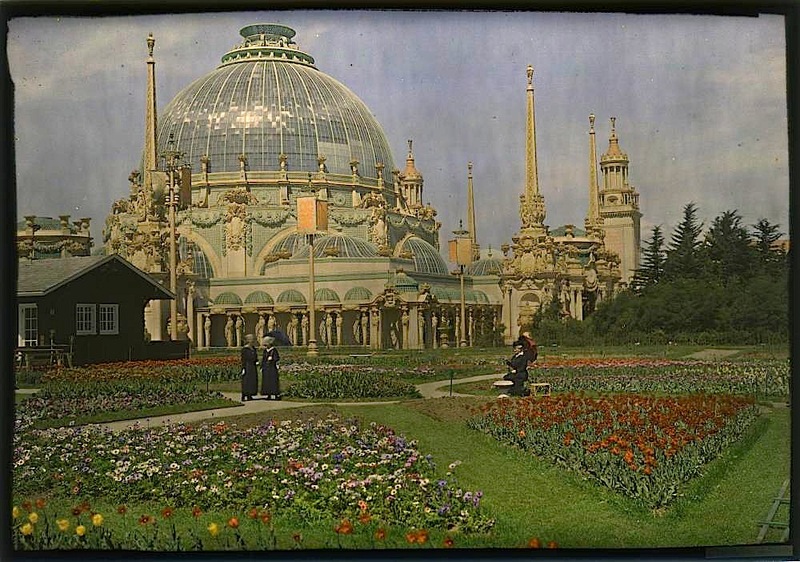 “Constructed from temporary materials (primarily staff, a combination of plaster and burlap fiber), almost all the fair’s various buildings and attractions were pulled down in late 1915,” according to Wikipedia.